I was invited by the Lighthouse Business Innovation Centre (Lighthouse) to present at a Teen Start-up in January 2017. 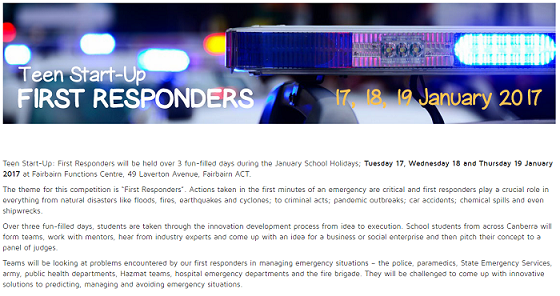 The topic of the start-up related to first responders and problem-solving real world situations relating disasters. Unfortunately, I was not available on the dates of the start-up to give a face-to-face presentation. As such, I participated in a prerecorded interview for the workshop participants.